New from Baden – The BL9 Big Leaguer, a unique practice training made from PVC. This ball has been produced to simulate the pitch of a real baseball. Ideal as a training ball or for beginners to the sport. 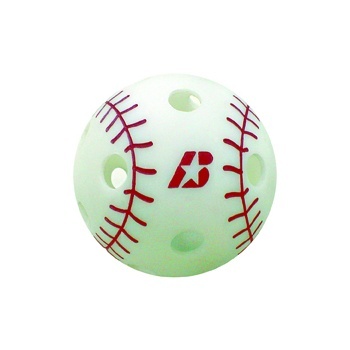 Baden is a specialist ball manufacturer based in Seattle, Washington. Baden design and manufacture balls for a number of sports and have been doing so for more than 30 years. Baden are totally dedicated to producing the highest standard of ball possible and development is continuous to ensure that Baden stays at the forefront of design for all sports. Baden's intent is clear from the catchphrase 'Passion for a better game'. The Baden Elite and Lexum balls are a combination of many years of hard work by Baden. They feature Baden's perfection design leading to the highest performance possible. Other innovations from Baden include the patented cushion control technology. Baden also developed the first women's size basketball. Baden balls are appreciated by the players and coaches alike and supply the official ball of England Basketball and Basketball Scotland. Baden balls are used for all matches under the jurisdiction of these bodies. Baden have been manufacturing basketballs for 25 years and since the beginning the hallmark of the company has been the slogan "Quality is Important"
Baden have developed and patented the revolutionary Cushion Control Technology (CCT). Thousands of tiny air cells from a cushioned carcass which adds softness to the feel and gives the ball a truer bounce and longer life. Look for CCT and feel the difference.